You can thank Zack for this one. Although I am not quite a mother yet, I am a mother-to-be (only 3 months left until Baby is here). Zack being the loving husband he is, wanted to do something me on Mother's Day. 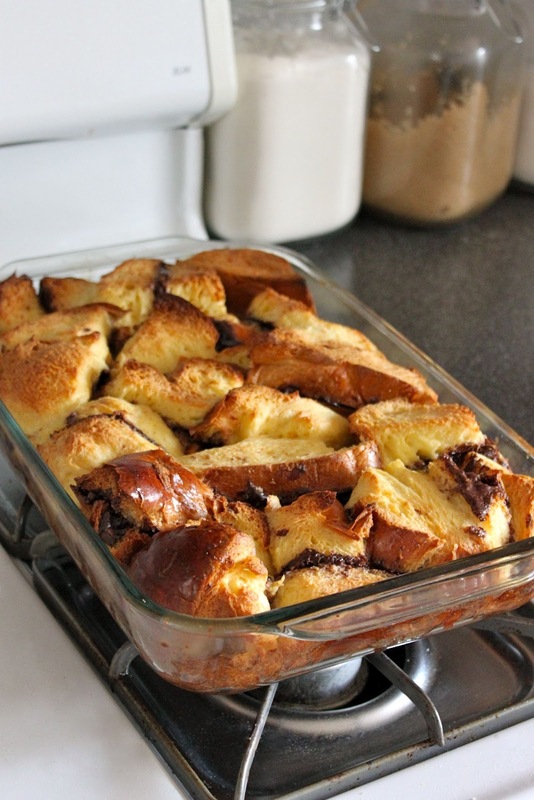 I am not sure how he came across this recipe, but knowing I love french toast, nutella, and breakfast in general he thought this would be the perfect thing to make for me and man was he right! I helped him a little with the preparation, not because it is difficult, but because I like to be in the kitchen. You prepare the french toast the night before you want to make it, then just pop it in the oven in the morning. Zack let me sleep in while this was baking; such a thoughtful guy. This french toast is incredibly delicious. I loved it so much that I asked if it could be a Mother's Day tradition. Butter a 9×13 inch baking dish. Pour a half-cup maple syrup on bottom. In a large bowl, whisk together the eggs, milk or cream, and vanilla extract until somewhat frothy and set aside. Smear five slices of bread generously with Nutella and top with another slice each to make five sandwiches. Cut each diagonally into quarters. Soak each quarter in custard mixture for one to two minutes, flipping to coat evenly. Transfer to the prepared baking dish. Pour the rest of the custardover the top and dot the top with butter. Refrigerate overnight. Bake at 365 degrees Fahrenheit for 35 to 40 minutes until golden brown.